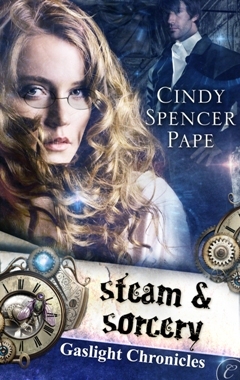 Today, author Cindy Spencer Pape is visiting to talk about her new steampunk STEAM & SORCERY, as well as her writing process. Also, there’s a contest! Stay tuned this Friday for a Danger Gal feature on STEAM & SORCERY’s heroine, Caroline Bristol. What inspired you to write STEAM & SORCERY? I love the idea of mixing genres, and steampunk is inherently a mix of S/F and historical, so that was appealing right from the start. Add in romance and some fantasy elements, and it was just too much fun to resist. Which element of story creation is your favorite and why? Probably the characters. I love world building too, but finding the right couple to fall in love is just the best. Iâ€™m not sure I really have one. I write wherever I can, whenever I can. Sometimes I know ahead of time exactly what Iâ€™m going to write and sometimes it just comes out and Iâ€™m as surprised as the reader is. Getting to make stuff up for a living is just the coolest job ever. Is there a certain type of character or theme that you find yourself coming back to again and again? Besides the whole HEA thing, of course? Iâ€™d have to say family. Not just the family a person is born with, but the one we create around us as we move through life. Well, up next at Carina is a mini sequel to S&S called Phantoms & Photographs, which will be a free download on April 25. Then book 3 of my Urban Arcana series, Motor City Werewolf comes out in August. Hopefully in June Iâ€™ll have the fourth of my Holiday Hearts series out from Elloraâ€™s Cave. Beyond that? Who knows? Whatâ€™s the first book you remember loving? I canâ€™t remember not loving books, especially fairy tales. No one title sticks outâ€”I loved them all. Do you read the same genre that you write? I write a bunch of genres and read them all, but I do read other stuff too, like romantic suspense, SF, fantasy and mystery. Whatâ€™s your advice to new writers? Learn your craft, but donâ€™t forget to have fun. And as you keep learning, keep writing. Donâ€™t quit, even if it seems like youâ€™re never going to make it. What do you enjoy doing when youâ€™re not writing? Reading, listening to music, playing games. I also love seeing new places, trying new things, meeting new people. Lisa, thanks so much for having me here today! To celebrate the new release, Cindy is running a contest. Comment on any (or all) of the blogs she visits on her blog tour this week. One entry per person, per blog stop. Visit Cindy’s blog to find the other stops. After the final stops on Sunday, March 13, Cindy will draw one winner for a free download of STEAM & SORCERY, or the winner’s choice of her other available titles. Happy Reading! Cindy firmly believes in happily-ever-after. Married for more than twenty years to her own, sometimes-kilted hero, she lives in Michigan with him, two adult sons & an ever-changing menagerie of pets. Cindy has been, among other things, a banker, a teacher, and an elected politician, but mostly an environmental educator. Her degrees in zoology and animal behavior almost help her comprehend the three male humans who share her home. Thanks so much for having me here today, Lisa! Great interview, Cindy. Sounds like 2011 will be busy with lots of releases….yay for us fans! thanks, Amber! I always appreciate your support! I’ve read Motor City Fae, but not Motor City Witch. I’ll have to get going if the third book is coming out in August and I love werewolves so I’ll be looking out for that one. http://bit.ly/hWa2M0 if you want to check it out! Mary Poppins meets Van Helsing? Sounds like it would make an interesting movie! I don’t know about how interesting a musical, though. Probably a little bloody for a musical, Fred!